As I wait for the turkey, I reflect on this year. It’s been a roller coaster one. It has been a big year of change. I concluded my overseas life, at least for now, ending a six year stint. I loved every moment of it. It was one of my lifelong dreams and I’ve accomplished it. I look forward to going home. I miss it. As much great memories as I have living abroad, home is still home. The move meant changes to my work. Changes to my life. I’m still not fully sure how the changes in my job are going to shake out to be. I decided to let things take its own course when I get back to work in January and not stress too much about it for the time being. It’s a strange feeling, that uncertainty. On the other hand, I’ve had my dream job for years. That’s an accomplishment most people can’t chase down their whole lives. I’ve been truly lucky. This year has brought about what felt to me to be a greater share of life’s ups and downs. Marriage. Birth. Illness. Death. I’ve celebrated joyous occasions with friends. I mourn in loss of another. I was diagnosed with PTSD. I lost track. Late last year or early this? Sometime in last winter, basically. I probably knew subconsciously but it was surreal to hear the diagnosis spoken aloud. On one hand, the brought about a resurgence of rage at everything around me. On the other, it was a relief that maybe I can start finding ways to organize, label, and bin this challenge I was now confronted with. I fall into the “wait and see” category for treatment. It’s hard when I’m suspended between moves right now. Routine, I find, is good for me. Ironic when a majority of my life has been the antithesis of routine. It’s the little things that inspire and ground me. Moments that suddenly ignite excitement and joy. It was a dinner with a befriended Croatian family revitalized my blogging. I gained a new perfect travel partner when I least expected to find one. I found the perfect scent diffuser, coincidentally named Happy, for my home. A bouquet of flowers- when was I last given one? Getting a peck on the cheek from a friend’s daughter, my favorite three-year old girl, brought a smile to my face that lasted days. Coming home means a new chapter of my life. And I’m finding in that new chapter, an appreciation for and an understanding of the little things. Holidays like Thanksgiving are perfect. I have the time to sit down and count my blessings. Sometimes, we all just need to be reminded. I believe I have mentioned my goal to sample all the Gordon Ramsay restaurants in London while I am here. As I progress through the list, I’ve mentally ranked all of them in order of preference. Current king (queen?) of the list is: Maze Sushi. Specifically the sushi bar, which took separate reservations than the Maze Restaurant or Maze Grill. The ranking might not be particularly fair.. but sushi done well has always had a special place in my heart. If anything, I walk away regretting the years of not knowing and opportunities to visit this place more regularly. Of first note was the bar. The sushi bar was really an extended addition to what would have been the bar counter itself. Perched in the corner, we had a great view over the bar.. and saw three large glass canisters of some liquid infusion. Intrigued and distracted from the drink menu, we kept guessing what it could be until one of us worked up the curiosity and courage to ask a server. What novel solution. The answer? Maze infuses and makes their own flavoured spirits. How awesome is that? Of course we had to order something that incorporated those ingredients, and fruit martinis all around it was. They were gorgeous, sweet but not overly, flavourful and deceptive. It was tempting to gulp the whole glass down and order a second. I had my desserts substituted with sorbet because of my lactose intolerance. Actually, they forgot, so as an apology, we got an additional scoop of sorbet. What a lovely and unexpected gesture. The extra bonus wasn’t the sorbet or the consideration. It was the service. We felt truly valued as customers. The restaurant was busy, but Laura, our server, always came back to us with her bouncy enthusiasm and follow up. Her asking how the food was didn’t feel like routine, but a sincere interest in ensuring that we were happy with our plates. At the end of the day, good food is easy to come by, but good service is what keeps us coming back. My day of food appreciation came late. I usually am sure to treat myself to a nice Thanksgiving meal whether I am home or on the road. But I somehow lost track this year, despite it being my favorite holiday. I made up for it, though. I took a cooking class a couple days later. Morocco cooking seems to be the vogue in the Western world lately. How better timed than this trip and a cooking lesson? The truth is tajines are easy to make. No real special cooking technique that any regular home cook can’t figure out between all the online resources of recipes and videos to search through. But, after a couple days of being inundated with aggressive vendors and being catcalled at to get my attention as if I were a call girl, being driven out to the edges of the countryside and surrounded by fellow food lovers was a lovely reprieve. The kitchen, Faim d’Epices, was in a studio in the far reaches of town. Pretty much into the countryside. It was a gorgeous red concrete building, as is typical of the area. Inside, was a large kitchen for the staff, and an open area with a ring of cooking stations, and the teaching counter on one end. There was also a separate bar counter used to demonstrations where we would gather up close. The business is owned and run by a French expat, Michel. I feel I’ve met more French in Morocco than any of my trips in France! Michel clearly has a passion for his job, and a sense of corny humour that never seems to go out of style. Who knows how many times he’s said the same jokes to each of his classes, daily. But as we are more often than not one-time clients, it never got old. As soon as we arrived, we were welcomed as if we have visited him personal home. Shaken hands the moment we step off the car, served tea or coffee while we did introductions. After the hustle and bustle of Marrakech medina, the quiet countryside with such sincere friendliness was refreshing. I also lucked out in having such a friendly group of classmates. We all had a lot of the same questions and complaints from our experiences in Marrakech. How to shop in the souks, how to find haggle when we didn’t care enough to bother, how to know when we were buying a true product. The class included a spice smelling quiz, wearing blackened fake purple plastic Ray Ban sunglasses that made us chuckle as we put them on. It occurred to me later that I should have checked the mirror to make sure I don’t walk out with raccoon eyes from any residual black markings. But I didn’t see any on anyone else so I figured I should be OK. By the way, I would have failed the spice test miserably, were I graded. We were given a demonstration on making bread, salad and crepes. 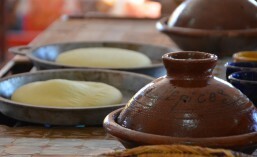 I was especially delighted to be able to give it a go in kneading my own bread. A lot of work for something I would consume in 5 minutes, but making bread has been on my to-do list for a while in my venture into cooking. We tossed together our tajines without much fanfare. The spices were already laid out in individual little bowls. All the effort it took was to split the portions into two and scoop them into a bowl to mix and marinate before cooking. As I said, nothing technical and nothing that couldn’t be looked up on the Internet. The tajine chicken marinated for about half and hour, and cooked in its container for about 45 minutes. The flavors were added on top of the marinade for the last 30 or so minutes, in our case, lemon peel and olives. We ate our meals outside on the patio to the side of the building, protected by the building’s shadow and some canvas awning above us. Yummy, I must say. As Michel offered us wine to go with the meal, I sat back, reveled in how full I was and what a lovely sit down meal I was having. 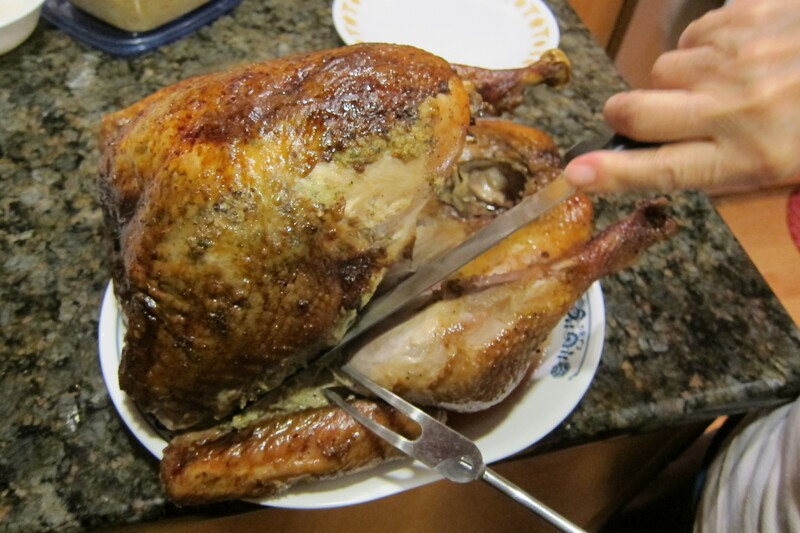 It then struck me: this *was* my Thanksgiving meal. Even if there weren’t any other Americans around me, and I had met these people only four hours earlier, I was sharing a happy meal, grateful for my company, and reveling in my good fortune as a whole. I was so full from the mid-afternoon meal, I really didn’t need dinner. I took that lack of hunger as an opportunity to venture and try one of the delicacies of Marrakech street food: la tete du mouton. Yep, sheep’s head. I figured if I was totally grossed out, I could just walk away and not worry about searching for more food that may not go down well. If I hadn’t watched the meat being pulled off the skull right in front of me, I would have thought it was just any pulled meat stew. It was served with bread, and an extra plate of simmering stock and sauce. We could get more sauce or bread if desired. Whooping 60 dihram, plus another 2 if you want to down the meal with a cup of mint tea, unlimited refills. Despite my not being hungry, I polished off the entire plate, eating with my bare fingers and getting my hand all soppy with oil. It was probably the best dish I’ve had in Morocco. I suspect the vendor was both amused and impressed by both the Italian tourist next to me and me.. we practically licked our plates clean. Belated Happy Thanksgiving, world. I am reminded how lucky I am to be able to see and taste so much of it. Well, seeing that I never claimed to be a recipe source, try this at your risk. I’ve taken to trying new cookie flavors. I’ve worked out a base original Nestle recipe that is tried and true, and figured out the timing, the temperature, and all the tiny details that make these cookies soft and chewy just the way I like them. However, I found as I add flavour, I need to modify the base recipe, to account for sweetness or varying baking speeds. I’m on the hunt to make a cookie that tastes like s’mores. Yes, the classic campfire burnt marshmallow sandwiched between two graham crackers and a piece of chocolate. But that perfect flavor is eluding me. I can’t seem to get the graham flavor replicated. I tried replacing flour with crushed graham cracker powder, throwing in bits of Golden Graham cereal, all without success. The cereal brought out the flavour, but came out in a really mealy texture which I found distasteful. I finally realized that I probably needed to change the cookie to reflect the ingredients of a graham cracker, albeit sans crunch. So here’s the recipe I finally came up. It didn’t quite taste graham-y, but it was closer. In fact, it tasted more like gingerbread, sans ginger. So, give it a go, if you dare, and please give me feedback to help me on my graham dilemma. Beat butter and sugars until creamy. Add in eggs until even. Add molasses and honey until texture is gooey. Beat in baking soda and salt. Gradually combine flour. Spoon mixture on baking sheet. 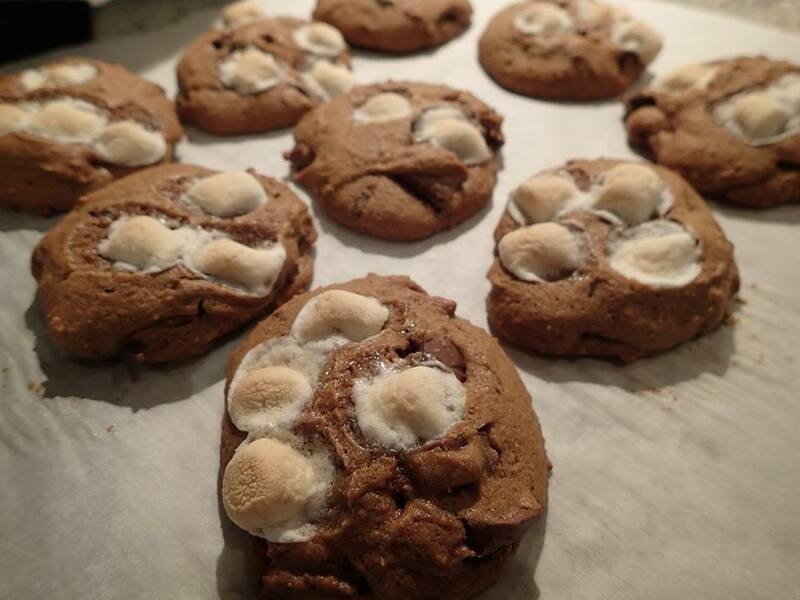 Place marshmallows on top of each cookie as desired. Don’t mix marshmallows inside mixture- baking temperature will melt and harden. Bake for approximately 10 minutes. Cookies may turn golden in the edges. Bake 3-5 minutes longer if you prefer your cookies crunchy. Thoughts? Suggestions? I’m open to them. Regardless of the lack of graham taste, these cookies were popular.. and gone in a flash when I brought them to work.